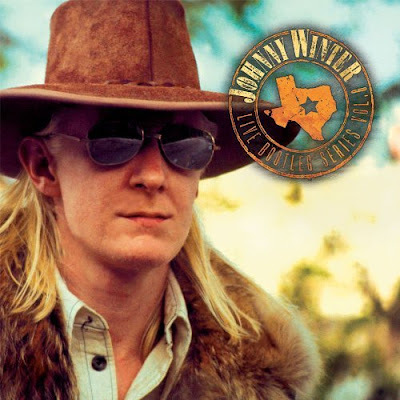 The book on Johnny: May 1 will see the release of Raisin' Cain: The Wild and Raucous Story of Johnny Winter -- a book nearly seven years in the making, and written with the cooperation of the artist himself. Author Mary Lou Sullivan spent hundreds of hours interviewing Johnny, and this book covers it all -- from his earliest days in Texas, to his fabled Woodstock performance, to his battle with addiction and beyond. Click here for an interview with the author at LiveBluesWorld.com. More information on Raisin' Cain can be found at this link. And the book can be pre-ordered right here. On the road: Johnny will play Higher Ground in South Burlington, Vermont on Friday (2/12), followed by a gig at Mill Street Brews in Southbridge, Massachusetts on Saturday (2/13). For a complete list of all Johnny's current tour dates, click here. Volume 6 arrives: The acclaimed Live Bootleg Series from Friday Music -- featuring quintessential live cuts selected by Johnny himself -- continues with the release of Volume 6. The latest offering finds the guitar hero putting his unmistakable stamp on some of his favorite tunes: Ray Charles' "Blackjack" (still a staple of Johnny's current live repertoire); Freddie King's "Sen-Sa-Shun"; and an epic, nearly 15-minute reading of B.B. King's "It's My Own Fault." For a complete track listing, and to learn more about the previous installments in this series, click here. On the Web: Follow this link for an interview with Johnny's guitarist and bandleader, Paul Nelson. And fans of Johnny will most certainly enjoy this interview by Tim Mattox. On the road: Johnny will tune it up tonight for a sold-out audience at the Tupelo Music Hall in Londonderry, New Hampshire. He'll then be off the road until next weekend, when he plays Higher Ground in South Burlington, Vermont (Friday, Feb. 12) and Mill Street Brews in Southbridge, Massachusetts (Saturday, Feb. 13). Other gigs this month include the Seneca Niagara Casino & Hotel in Niagara Falls, New York (Feb. 19) and the Palace Theatre in Stamford, Connecticut (Feb. 20). (Johnny will be appearing in Stamford with the Debbie Davies Band.) These shows will be Johnny's last U.S. performances until April; he'll spend the entire month of March on a 17-date swing through Europe. For a complete list of Johnny's confirmed tour dates, click here.